November is National Military Family Appreciation Month and where do we even begin? Not only do these families sacrifice their time together, but they but they put their lives on the line, move their families all over the world continuously, and live on a very limited income. This life can be hard for many of us to imagine if we are healthy, but consider those moms and dads who are chronically ill; those who face the daily pain and physical limitations at we face living with illness, yet they also have a spouse who may not even be home for months at a time. Wednesday Jocelyn Green, author of Faith Deployed will share a story with us from her book about a chronically ill mom and wife who is in a military family. The article, “Worn Out and Weary” is by Ronda Sturgill, quite an amazing woman that we featured on the cover of one of our HopeKeepers Magazines [no longer in print] back in 2005. A couple of weeks ago we asked our readers if there were any military families out there who would be willing to share a look into her life, and Erin eagerly responded. 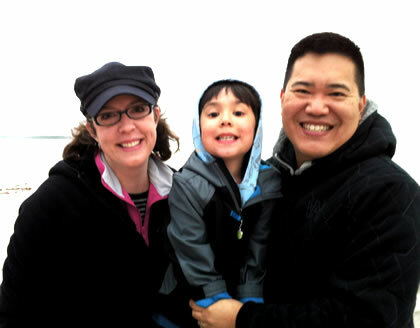 So, I am proud to introduce you to Erin Wang and her family. Can you tell us about your family and the illness you live with. My husband and I have been married for almost seven years. I married him late in his US Navy Officer career, and have not had to live with long deployments, but he does travel frequently. We have one five-year-old son. While I have always had chronic migraines and headaches, I was diagnosed with severe fibromyalgia when my son was born while we were stationed in Japan. I still feel like I’m not to the bottom of my diagnosis, as I have new symptoms developing. How do you prepare for your husband’s deployment in regard to your illness and it’s challenges? I have experienced being stationed in five places in six years of marriage–and this really has been one of the hardest parts for me as I live with chronic pain and illnesses. Preparing for my husband’s (often overseas) trips has been quite hard because of these moves, and I have had a little-to-no support system. With the stress of a fresh move under my belt, it seems that the first trip my husband takes after each move, my body gives out in some unexpected way, and I’m literally left with no known person to call for help. Calling on strangers in my greatest time of need has not gotten any easier. Since you likely do not live near family, who is part of your support team? I hire babysitters off the internet, and have to trust that God will send me the right person. (He has every time! )– though I stress out over doing the process again and again each move, and make sure to stay home in a separate room for the first few times they babysit! This is always one of the first things I do after a move, as I know that that help is the only thing that keeps me going as a mom with chronic illnesses. I am generally outgoing and push myself to seek relationships quickly with every move– with new neighbors (on and off bases, depending on where we have lived), church members at new churches, and strangers I start conversations with in the stores and schools and at playgrounds of new cities. But it is often just too physically hard to be able to do the things that build and maintain relationships, when simply getting a shower two times a week is a miracle! And I feel I must hoard what little energy I have to be able to care for my son, let alone make my doctors appointments. Regardless of who I meet, opening up to new people who don’t know anything about me and my past has been difficult. I have been judged and rejected more often than accepted. With each move, I have joined or started chronic illness support groups, sought out professional counselors, joined women’s Bible studies and couples bible studies, joined a Japanese play-group or two (I speak Japanese and had been a missionary to Japan). The only success I felt I really had was the emotional support of the chronic pain groups, whether Christian or not. I have a personality that is intensely open and honest about my reality, including that I am a childhood abuse survivor, and I guess I have learned that these moves and building deep-but-brief relationships with “healthy” women is just not what is going to happen for me. But God may surprise yet! Really, my best support team member is my God! Early in my diagnosis, I really struggled to even go to church or read my Bible for the first time in nearly thirty years of being a Christian. Praying was really just me crying–mad at God! I had been married just two years to my husband– two years to the Navy Life. I had a six-month-old colicky baby (diagnosed later with Sensory Processing Disorder/ SPD), and had just gone through an international move, among other things! Where was God? It really has taken time to re-build what my relationship with God is. And I am still trying to figure that out. But I know He is faithful. I know God is love. What are some of the challenges you face as a chronically ill spouse living in military life? Changing doctors so frequently has been hard as well, as there is no history or continuity of treatment. I have really been learning to be my own advocate and to know my illnesses and medications. And there is the added benefit of getting loads of “second opinions”! It was my fourth Neurologist on my fourth move that diagnosed me with Essential Tremor (that others had discounted) and persevered to find a medication that helped my migraines for the first time in twenty years of having them. Praise the Lord!! When you have to move, how do you do this without overdoing physically? Do you have a system you’d like to share? People joke that I must be an expert mover! That really is not the case– and there are career military spouses out there that have moved many, many more times than me. Every move has been so different for us– by car, by plane, by rental RV. Twice we’ve been given a last-minute change of orders to a completely different country let alone state! And a year in our child’s life brings great changes to how that move will effect him. Moving is just simply: hard. And in reality, my way of dealing with illnesses and moving has been to trust God with the finances of not moving the “cheap” way. We often chose to do extra things to care for my body like paying for someone to professionally clean our rental before we check out, or like staying in hotels when the movers are packing up or before our household goods arrive to the new place. We always have the movers unpack as much as possible and open every box in the new house, even if they put things in the wrong places, because then I won’t have to bend and reach and use my painful hands quite as much. My body will inevitably give out anyway– adrenaline can only go so far so long during a move! But little steps can help, and I always try to find those things that I can do to care for myself. What advice would you give someone who ill and who has a spouse in the military? I really don’t know that I would have any advice for other chronically ill military spouses than just to cling to God–even when you’re “mad” at Him for all that is going on in your life and body. He will show you the way to go– what church to go to or not, what new friend to pursue or not. Thank you so much, for sharing, Erin. I have a lot of admiration how you seem to handle it all with grace. Thank you for serving our country through supporting your husband and traveling all over where he is sent. I guess what I wrote does seem that I handle all this graciously?? I hope I can be the first to say that while I have perservered, close friends & family know the ugly, not-so-tidy side of this!! I hope I can give hope to those who tire of reading how “perfectly” others handle their illnesses & circumstances– I do fail & fall oh-so-many times, only to have my Lord meet me again in the depths of the pit (Psalm 40:1-3)…..